Do you know what? You guys love food. These “What I Ate Wednesday” posts have been so popular, and that makes me think I’m going to keep doing them. 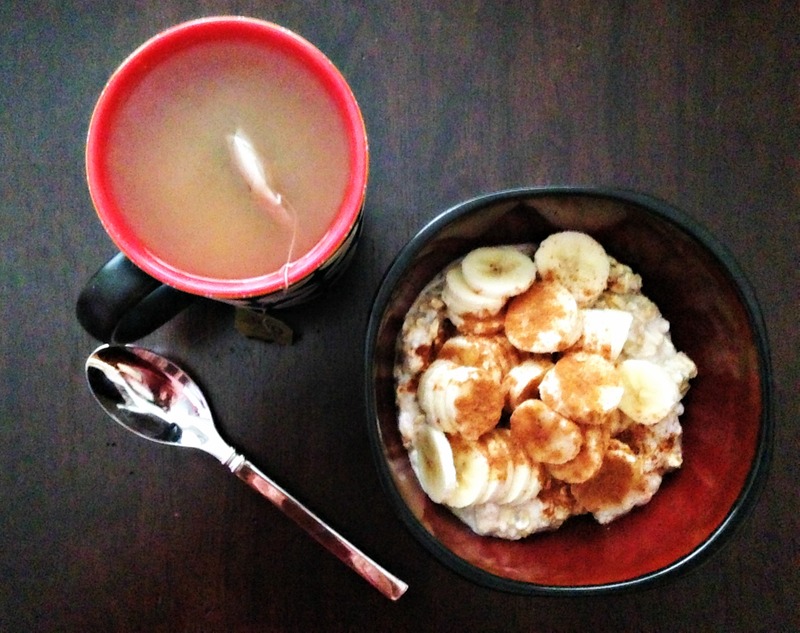 I made a batch of overnight oats the day before, and enjoyed those topped with a banana. My overnight oats consist of Greek yogurt, almond milk, chia seeds, gluten-free rolled oats and cinnamon. It’s a hearty breakfast with about 20 grams of protein, so it keeps me full until it’s time for a morning snack. And every morning, I like to start my day with a mug of green tea to go with it. Mid-morning snack at 11:30 a.m. 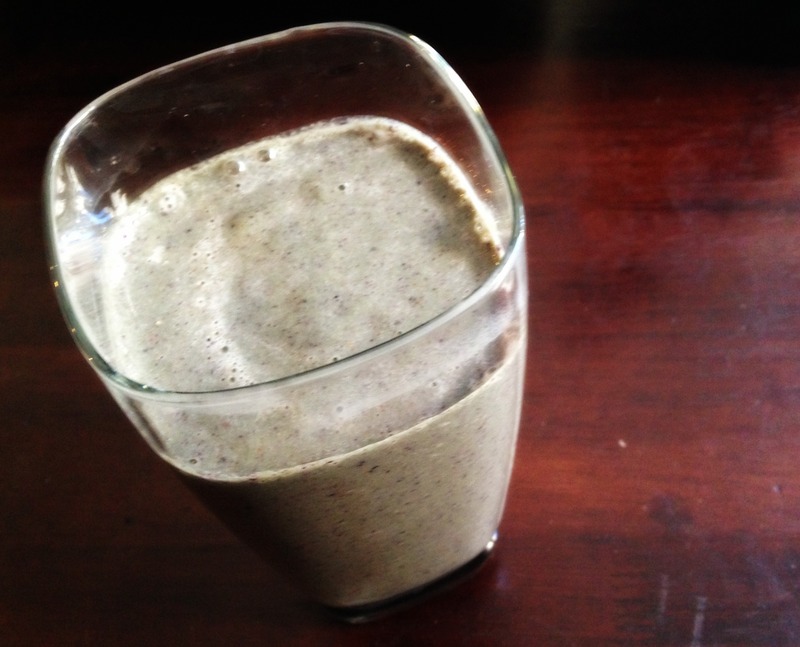 I made a green smoothie in my Nutribullet, which consisted of cucumbers, frozen spinach, frozen blueberries, a scoop of almond butter, almond milk and some stevia for extra sweetness. 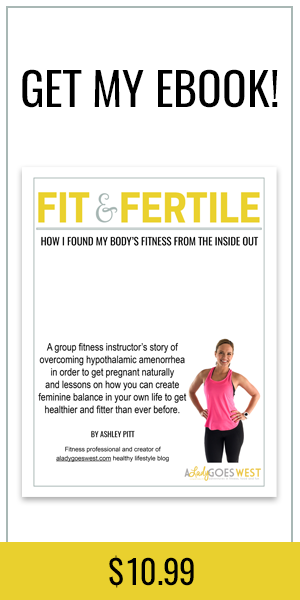 I actually poured this in a to-go mug and took it with me on the road to the second day of my pre- and post-natal personal trainer specialization workshop at Equinox in San Mateo, which I will be reporting back on very soon. A salad. 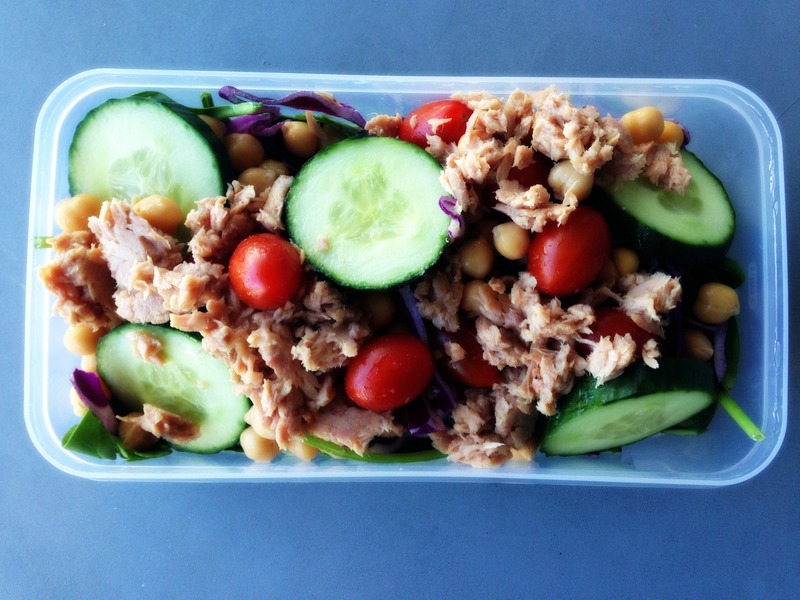 That’s a bed of spinach, purple cabbage, cherry tomatoes, garbanzo beans, cucumbers and a pouch of tuna. Whenever I make lunch to-go, I always do a salad because it’s so easy to throw together. It takes me no time at all to grab handfuls from bags of fresh produce and seal it up. While this is a super tasty salad, it’s on the smaller side for my normal lunches, and I probably have it about three times a week on average, changing out the veggie combinations at times. 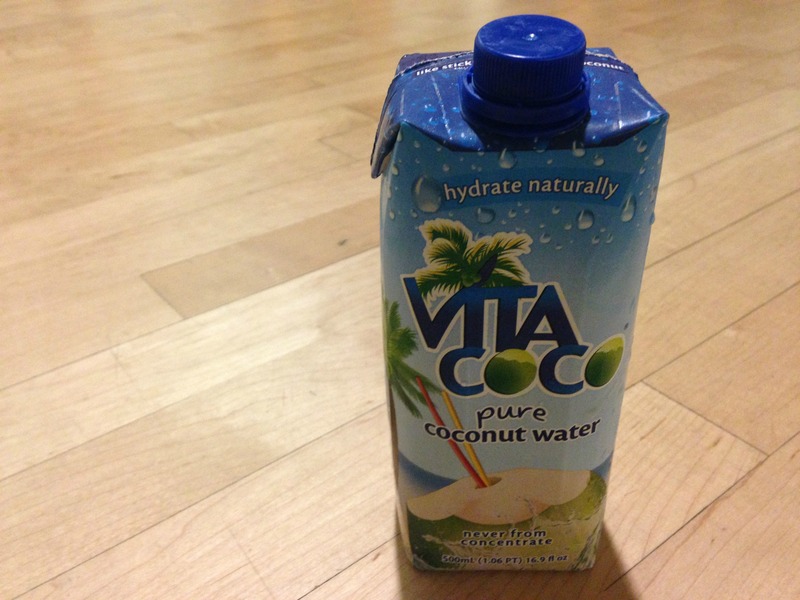 Post-lunch treat at 2:30 p.m.
Because I can’t go a day without a coconut water, I popped this open during the workshop for a little extra hydration. 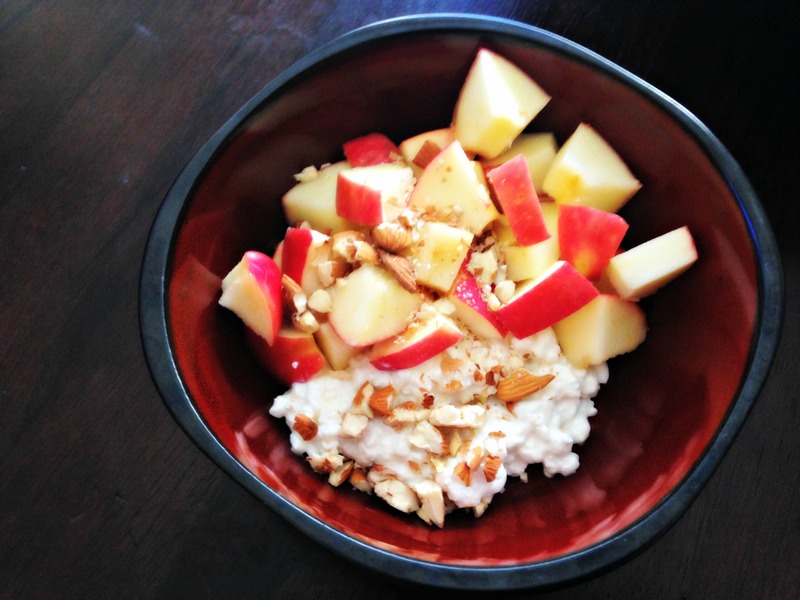 Mid-afternoon snack at 5 p.m.
Once I got home from my training, I made myself a bowl of cottage cheese, topped with a chopped up organic gala apple and some crunched up almonds. This snack is one of my favorites, because it’s got all the protein you need and the flavor profiles go so well together. If you’re a regular around here, you’ll notice I tend to eat a lot of these three food items separately, so putting them together in a bowl makes me very happy. Pre-dinner cocktail at 7 p.m. Yes, you see that right. 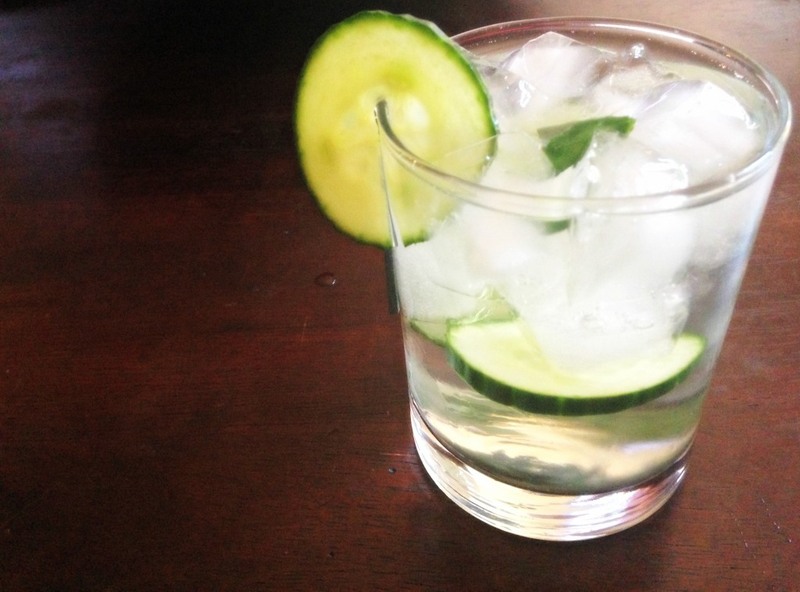 We had some cucumbers and some vodka, and Dave asked me if I wanted a cocktail. So I said yes. While I don’t normally have anything but wine to drink a couple nights a week, lately I’ve been mixing it up with some clear martini-type beverages. And Dave is a great bartender. Sunday night in our little apartment means taco night. Dave is our chef and he spends a good amount of time chopping, dicing and preparing everything nice and fresh. 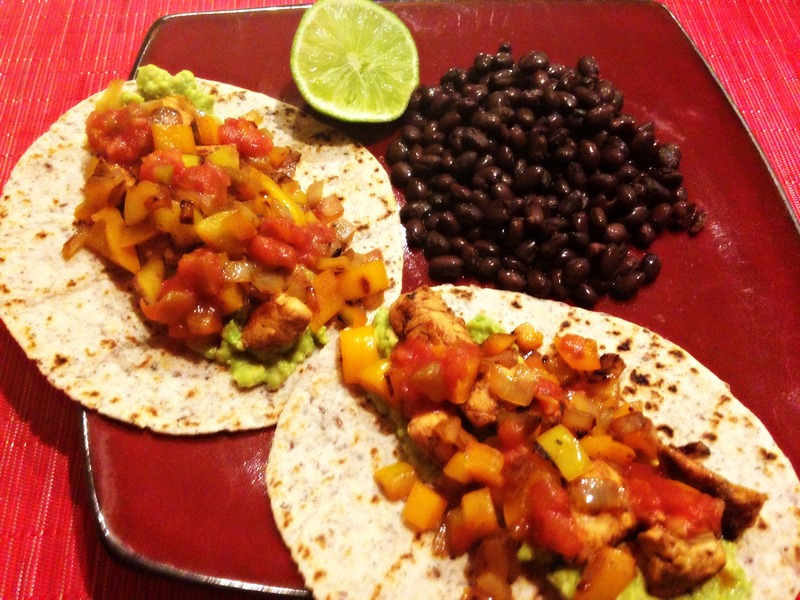 We had blue corn tortillas, grilled chicken, sauteed peppers and onions, guacamole, hot salsa and some black beans. Even though this picture looks neat, this dinner gets awfully messy. It’s something we look forward to every Sunday, as the Spanish Guitar station on Pandora blasts through the TV while we cook, eat and clean. Post-dinner beverage at 8:30 p.m. 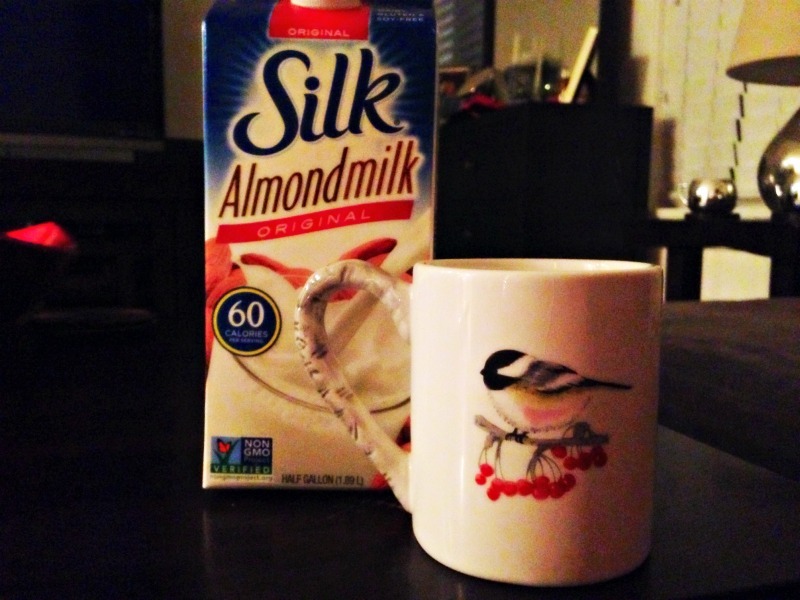 It wouldn’t be the end of the meal, if I didn’t have some almond milk. I warmed up this mug to nearly steaming and sipped it slowly as we watched Weeds. We’re on season two and love it so far. I really like it when a show is only 30 minutes, because I tend to fall asleep during the full hour shows. That’s what happens when you have to wake up at 5 a.m. — you tend to doze off before 10 p.m. each night when lying on the couch in front of the tube. That’s it, my friends. A full day of everything I ate and drank, outside of a few vitamins and mints. I had a lot of veggies, a lot of good protein and a lot of variety. I think that made up for the carrot cake and pumpkin pie consumed the night before. Right? I’m heading off to train some clients, then will be teaching BODYATTACK later tonight. This is my second week teaching in this new time-slot, and last week was packed, sweaty and well worth the walk. What are you watching on TV right now? Do you have any Netflix recommendations for us? Are you the cook in your house or is it someone else? Mmm, everything looks so yummy! I love a day full of healthy foods to kind of “reset” you after indulging. 🙂 Your schedule is a lot like mine — plenty of snacks keep my belly happy! Hi Emily, yes, I’m definitely someone who always has my snacks, and I never miss a good Saturday indulgence. 🙂 Hope you have an awesome day. Parenthood on Netflix is our go-to show right now. It’s always been a favorite of mine! My husband can grill, but it would be scary to see him do more than that in the kitchen (and he’ll fully admit that!). I’m not an amazing cook by any means, but I get the job done! Hi Ashley! Hahah, yes I wish we had a grill, but not quite doable in our city apartment. That’s great he takes care of grilling. I’ve never seen Parenthood, thanks for the tip. That cocktail looks lovely! Do you like the nutribullet? I was considering buy it since my magic bullet is slowly dying. I do the bulk of cooking, but my boyfriend always somehow swoops in to cook the meat. He always so I overcook it. It is always fun to cook together though. To tell you the truth, I loved my Nutribullet for the first few months, but I feel like lately the blades aren’t cutting frozen spinach as easily… But it was awesome for like 9-10 months, so worth the $100. Like Ashley, we LOVE Parenthood–cannot WAIT for the last season to start in a few weeks! On Netflix, we’re watching Orange is the New Black…I’m not a devoted fan but it’s pretty entertaining. Hi Kim, I like Orange is the New Black too and have watched both seasons. I also read a really interesting article the other day about women in prison and the need for changes because prisons are designed with male prisoners in mind. It was on NY Times and referenced the creator of Orange is the New Black. Anyways, thanks for the tip on Parenthood as well. Here in Canada we don’t have HALF the great shows you guys have, but I’ve been catching up on The Good Wife ( I am slow on this TV show train) and I actually just started watching a mini-series called ‘Mixology’. It’s only 20 mins and it’s horrible acting, but it’s mindless and is pretty funny! Otherwise, I am anxiously awaiting House of Cards to come back!!! Your eats and treats look delicious! Hi Fiona, I liked House of Cards too. The actors in that show are incredible. I’ve never heard of Mixology, but am also a fan of mindless shows. Your meals look a lot like mine (totally awesome, of course!). The only thing I noticed…you needed some cinnamon on your 5 pm snack! I’m with you on the 5 am wake up calls. I wish I would nod off at 10, but I have to force myself into bed at 10:30. I wish the day was 26 hours instead of 24. I hate going to sleep that early–I have so much I still want to do. But it is what it is. I have a few staple tv shows that I can’t get enough of. All of them are network shows, even though everyone LOVES Game of Thrones, Orange is the New Black, Breaking Bad, etc….I like the cheap thrills. ABC has some of my favorites: The Goldbergs, Castle, The Middle, and Modern Fam. And, of course, I love Reckless on CBS. It will probably be cancelled, but I’m from Charleston, and they nailed it with this show (filmed in Charleston), so I get all excited every Sunday night. You have to stay up late for this one, 10 pm on Sunday, but I won’t miss it! I’ve heard Weeds was a great show, but still haven’t seen it. Mary Legare Whaley recently posted…iWatch? iWant. I love your WIAW posts 🙂 And this is so refreshing that is was your eats from a rest day! I tend to fall asleep during hour long shows too- whenever the Apprentice is showing, I always have to watch half and save the rest for the next night! I’m right there with you! I get so tired hehehe!